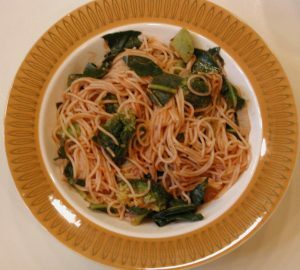 Broccoli collard greens angel hair pasta is a vegan recipe that will serve 4 to 6 adults as a main meal. It takes about 20 minutes to prepare and about 30 minutes to cook. Begin by putting the pasta pot with water on the stovetop on high heat until the water boils. While the water is heating, wash and clean the broccoli and fresh collard greens, and peel the onion and garlic. Dice the onion and place in a large covered baking dish along with the garlic, basil, oregano, and fennel seeds, and cook for 5 minutes in the microwave oven. While the onions are cooking, cut the broccoli and fresh collard greens, and add them to the covered baking dish. If you are using frozen collard greens, add them on top of the broccoli in the baking dish, cover, and put the dish back into the microwave oven, and cook until the veggies are tender. Mix every 5 to 10 minutes. When the water is boiling in the pasta pot, add the angel hair and mix well to make sure that the pasta is not sticking together, then cover and turn the heat off and let stand until the pasta is tender to your liking; then drain off the water. Mix the crushed tomatoes with the angel hair to keep the pasta from sticking together. When the veggies are cooked, add the angel hair and crushed tomatoes, and mix well. Heat for another few minutes to allow the flavors to blend.